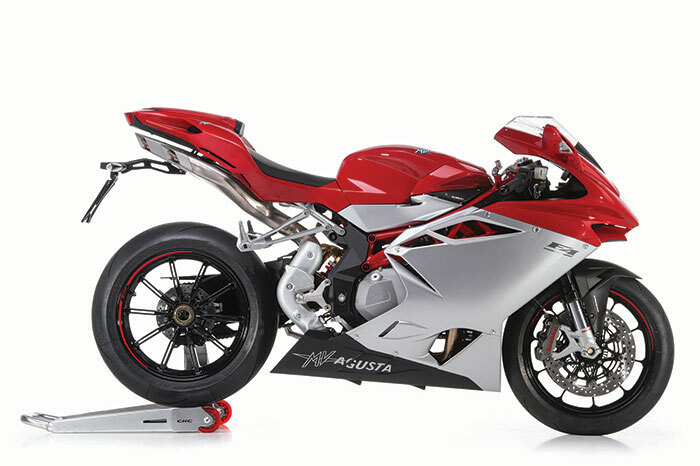 come together in the MV Agusta sports model par excellence. State of the art electronics, lightweight construction and maximum attention t o detail. The new F4 is now even more highly evolved, designed to overcome every challenge: on the road, for maximum riding pleasure, especially on the track, where performance is all that matters. THE MV AGUSTA F4. Breaking down the barriers of imagination. Encompassing cutting-edge technology and the latest engine design, the F4 is the best yet. A masterpiece. The top-of-the-range F4 RR contains unparalleled engineering solutions and thoroughbred excellence, ensuring total bike control and heart-stopping performance: an inertial control platform with lean angle sensor, a redefined riding position, full Ride-By-Wire, Ã–hlins electronic suspension and steering damper as well as GP-spec titanium con rods. All with completely new graphics and colors. The F4’s racing windshield is designed to effectively pierce the air, while at the same time protecting the rider at high speeds. Offering maximum comfort, a stylish design and unparalleled aerodynamics, the new F4 is both balanced and seductive, impossible to resist. The compact and highly-efficient headlight is now flanked by elegant light guides just beneath the airbox intake, delimiting the lower spoiler. This feature serves both a functional and aesthetic purpose, rendering the F4 even more personal, recognizable and safe. breakthrough that’s immediately reflected in performance and ride quality, exalting the excellence of MV Agusta engineering both on and off the track. its brightness has even been improved. An advanced four-cylinder ‘short-stroke’ engine powers the entire F4 range. Piston diameters of 79 mm are combined with a stroke of 50.9 mm. On the F4 RR the peak rev limit has been raised to 14,000 rpm. 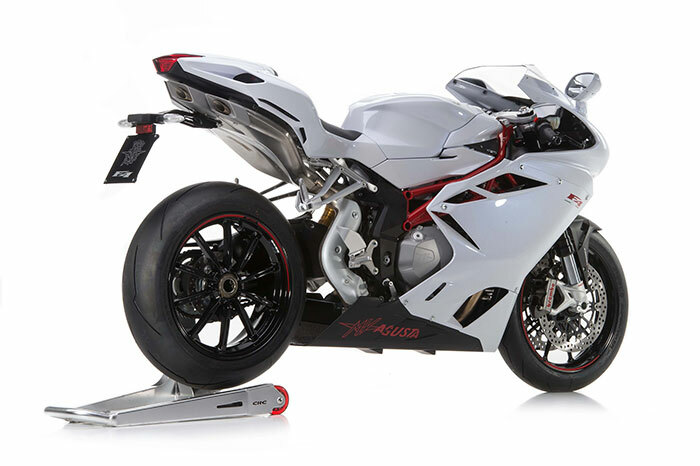 Assembly is now marked by an even greater degree of expert craftsmanship to give absolute precision, with all components being selected and measured to ensure perfect uniformity and maximum performance: a procedure unique to MV Agusta. The engine timing system has been given an extensive upgrade: the intake and exhaust valves now use a single spring instead of the two seen on the previous model, thus reducing moving mass and boosting both maximum engine revs and the rev variation rate. The piston blanks are hard-anodized, making them even more durable and reliable. The con rods on the F4 RR are made of titanium, a solution more akin to a GP racer than a production machine, giving improved strength and lightness; the engine also features a rebalanced crankshaft. The oil circuit has been redesigned, both inside and outside the crankcase, ensuring perfect main bearing and con rod lubrication and thus boosting reliability, even under extreme conditions. Moreover, the engine now runs at lower temperatures thanks to enhanced radiator efficiency and redesigned oil routing. The short-stroke inline four-cylinder engine is available in two power configurations: on the F4 it reaches 195 hp, while the F4 RR puts out a jaw-dropping 200.8 hp. The fuel delivery system features 50 mm diameter throttle bodies with a fully revised variable length intake tract (TSS). 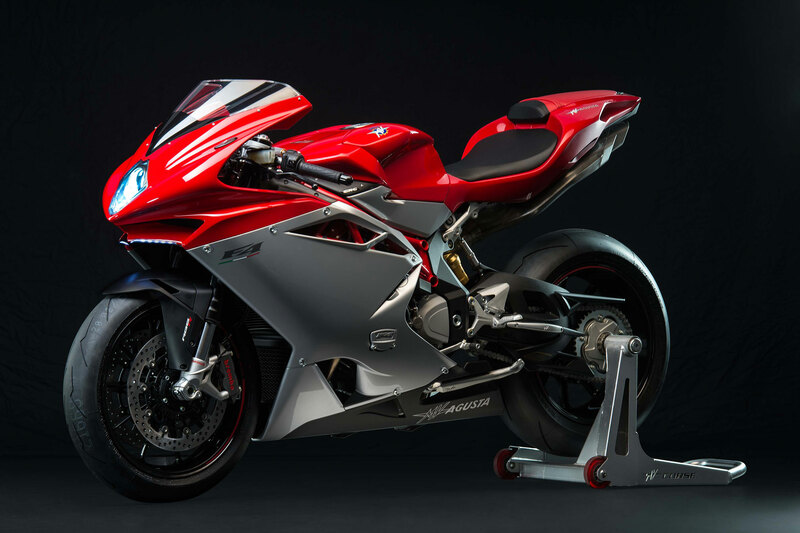 The gearbox is – as on all MV Agusta four-cylinder engines – a six-speed unit, with the clutch featuring a mechanical slipper device. Four engine maps are available: three default one plus a fourth that can be customized by the rider. The personality of the F4 has now been sharpened even further by combining a design solutions with distinctive features that have already seen the F4 walk away with countless best-looking-bike awards. Now details boost its appeal even further, this time with light playing a key role in the choice of new graphics and color and, of course, in headlight and tail light design. The front headlight is flanked by two distinctive ‘light guides’ on the leading edge of the spoiler, thus making an aerodynamic part essential to the bike’s frontal look, both day and night, and boosting safety by improving frontal visibility. Similarly, an integrated light guide increases the brightness of the rear light assembly. Completely wheel designs offering considerable weight reduction are available in two versions. The first, on the F4, utilizes razor thin spokes and a silver finish. The second, on the F4 R cuts weight and material thickness even further thanks to a special aluminium alloy forging process and offers attention-grabbing race-inspired design. There has also been a significant upgrade to the four-tailpipe exhaust system, a characteristic feature of the F4 ever since its inception. The two outer pipes are now much shorter and tapered, while the central pair extends beyond the end of the tailpiece. Making the F4 even racier – and lighter – than ever. The MVICS (Motor & Vehicle Integrated Control System) platform integrated on the F4 ensures precision control of multiple engine maps and rider assistance devices such as traction control and EAS (Electronically Assisted Shift) ready (accessory). Electronic redundancy ensures maximum effectiveness and safety: data from the two potentiometers is cross-checked with analogue signals, while a third sensor confirms the complete throttle closure requirement; two additional sensors are installed on the throttle bodies. Developed specifically for F4 – is the inertial platform sensor set-up: this uses three gyroscopes and three accelerometers and provides the electronic control unit with an array of moment-by-moment info on vehicle dynamics. Consequently, traction control intervention is particularly accurate, thanks also to an encoder on the front wheel. This is a system that boosts both safety and performance, simplifying the entire riding experience, a key goal of the F4 project. The algorithms that define operation of the MVICS system continuously maximize the available torque at the rear wheel according to both road conditions and the rider’s own demands while electronically assisted gear shift, shortens gear changing times. A further innovation is the Custom map, which lets you choose your own settings as an alternative to the default Normal, Sport and Rain options. This lets you customize five parameters (throttle sensitivity, torque, speed limiter, engine response and engine braking) so you can build up an engine control map that reflects your own individual riding style. The hallmark structure and geometry of the F4 remain unchanged. 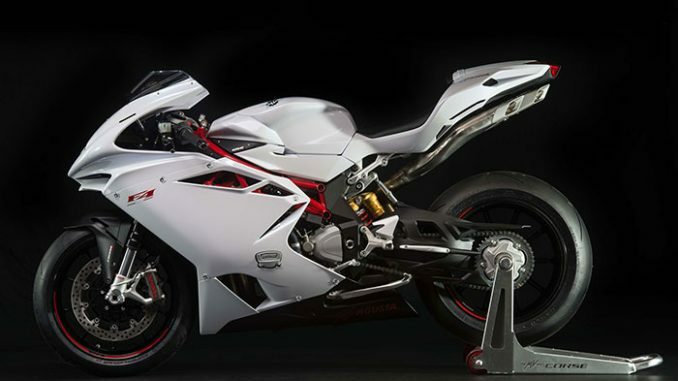 The frame consists of two distinctive elements, developed by MV Agusta to offer the advantages of two solutions that are usually proposed separately. 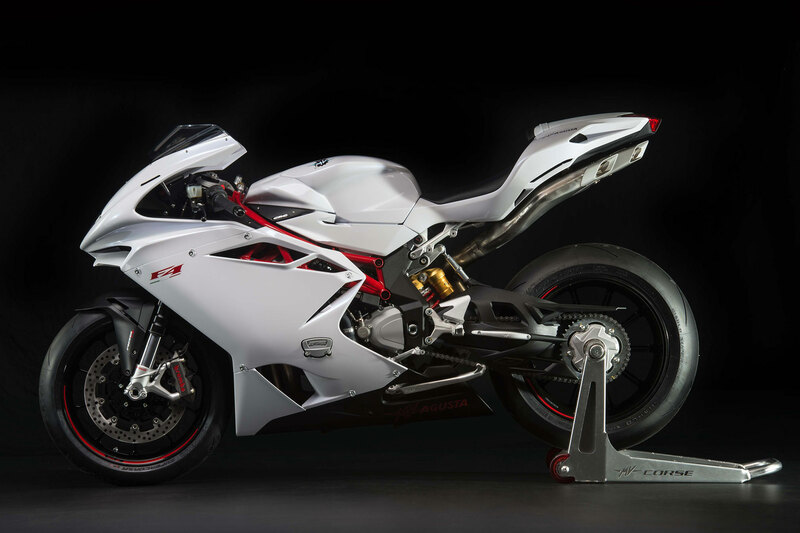 The main section of the frame, in fact, is made of CrMo steel tubing: this joins to a pair of cast aluminium alloy plates to form a complete structure and provide a pivot point for the sculpted single-sided swingarm. Further frame optimization has reduced weight without sacrificing rigidity. The F4 RR is also hand-welded using TIG technology and uses a dedicated steel with exceptional mechanical properties. The three versions offer three distinct combinations of fork and shock, while all provide the traditional F4 handling strengths. The F4 features a 50 mm Marzocchi fork and Sachs monoshock, both fully adjustable. As you’d expect, the F4 RR offers up a concentrate of technological excellence and complete personalization: Ã–hlins suspension with electronic control lets the rider choose between different setups directly from the dashboard. A different suspension set-up is available for each of the four-cylinder engine maps; however, the rider can also adjust suspension independently of the maps. The system provides separate control for compression and rebound damping, while spring preload personalisation is manual. The electronic steering damper has both a manual and automatic setting, the latter varying its response according to vehicle speed. Offering state-of-the-art stopping power for the hypersports category, the F4 RR braking system features two 320 mm front discs with steel braking rotors, paired with the Brembo Monobloc M50 – (M4 for F4) the very best in terms of performance, weight and stiffness – and a dedicated radial pump. The system is completed by a four-piston rear caliper operating on a 210 mm disc. Max. power – r.p.m. (at the crankshaft)** 143.5 kW (195 hp) at 13400 r.p.m. Max. torque – r.p.m. 110.8 Nm (11.3 kgm) at 9600 r.p.m. Rear brake Single steel disc with Ã˜ 210 mm (Ã˜ 8.27 in.) dia.